Windows 10 is the newest version of Windows, check out our last blog post on Windows 10 to see if making the switch is right for you. 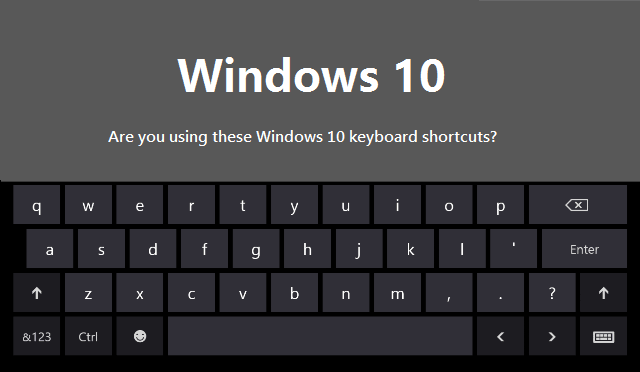 Using Windows 10 comes with a lot of benefits, including some new shortcuts you might not have known about. We have compiled a list of shortcuts we think would most benefit the Pagoda Technologies customers. Windows - Pressing the Windows button allows you to open up the Windows 10 Start Menu. Windows + Tab - Pressing Win+Tab launch Windows 10 Task View. This new task view interface displays shapshots of all the windows you currently have open in your desktop and allows you to interact with them. Windows + A - Pressing Win+A opens the notification center and alerts you to items that might need your attention. Windows + C - Pressing Win+C opens Cortana in listening mode. Then you can speak to her and ask her to find a file on your computer, search the web or add an event to your calendar. Windows + G - Pressing Windows and G opens the Windows 10 Game Bar. Here you can take game screenshots and record gaming videos of Windows 10 games. Windows + H - Pressing Windows and H allows you to share content if it is supported by the current app you are using. Windows + I - Pressing Windows and I opens your Windows 10 settings. Windows + K - Pressing Windows and K will connect you wirelessly to displays and audio devices. Windows + Q - Pressing Windows and Q will search the web and Windows with Cortana. This is activated through speech. Windows + R - Pressing Windows and R allows you to run a command. Meaning instead of opening a document by searching for it, you can just press Windows and R and open the document of your choice. Windows + S - Pressing Windows and S is similar to pressing Windows and Q. The difference is ‘S’ lets you search the web with a keyboard input instead of being voice activated. Windows + X - Pressing Windows and X opens the start button context menu. Windows + Right or Windows + Left, then Windows + Up or Windows + Down - Using these key functions, Microsoft has improved support for Snap, a feature that lets you arrange windows in a way that makes you more efficient. You can snap windows side by side in Windows 10. However, Windows 10 also lets you snap windows into a quadrant formation. To get from your lower right window to the upper left, press Windows + Left and then Windows + Up. Windows + Ctrl + D - Pressing Windows, Ctrl and D all at the same time opens a new virtual desktop. Windows + Ctrl + Left or Right - Press Windows, Ctrl and Left or right if you want to switch between your virtual desktops. Windows + Ctrl + F4 - Pressing Windows, Ctrl and F4 is a quick way to close the current virtual desktop. Windows + 1,2,3,4 etc - Pressing Windows and 1 or 2 (etc) will open programs that are pinned to taskbar. E.g. if first pinned program on your taskbar is Windows Explorer (from left to right), the shortcut Windows and 1 opens Windows Explorer for you. Windows + Space - Pressing Windows and the Space Bar allows you to switch your keyboard input language if you have added at least a second language. Windows + Shift + Left or Right - Pressing Windows, Shift and Left or Right will move your current Window from one monitor to another. This only applies when using a multiple monitor setup. Alt + Space - Pressing Alt and the spacebar will restore, move, size, minimize, maximize or close current window.